The year is well underway, and most of us are back in the swing of things. It also means that it will be getting more difficult to keep up with the regular cleaning needs of our homes. Between making sure everyone is fed, prepared for school or work and trying to get everything else done, there’s scarcely time for any regular cleaning. Fret not! The pros at Simply Spotless are ready to come to your rescue. Keep reading for a few tips that will help you create a routine for keeping your home clean and preventing messes from piling up. The simplest way to nip countertop messiness in the bud is by doing a quick wipe down of each surface with each use. A damp cloth and an ammonia-based detergent or lemon and water spirits should do the trick and prevent sticky stains from accumulating. We all know how tough over grease can be to clean. Make a paste with bicarbonate of soda, water and a dash of vinegar and spread it across the inside of your oven. Leave it for a few hours and all that will be left to wipe off in the morning is the broken down grease particles. Get into the habit of pouring toilet cleaner along the edge of the toilet bowl once a day. Every time you flush, the detergent will get to work, and your bathroom will smell fresh too. Your home automatically looks neater if your dishes are packed away. Teach each person that you live with to pack the dishes away into the washer or sink, which will make it easier for the person on dish duty when it’s time to clean them up. Bonus tip: Make washing dishes a daily task – this way it’ll be simpler to manage and less likely to morph into a monstrous mess. Fighting dirt is easier when you know what to use to clean up messes when you’re out of store-bought cleaning products. Keep some soda water, vinegar, bicarbonate of soda powder and citrus fruit (especially lemon) handy, and you’ll always be good to go. 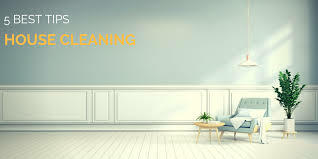 If you need to call in some reinforcements beyond these house cleaning tips to use in 2019, Simply Spotless has all the cleaning products and services you could ever need. Book a cleaning service now!